Let's review the best and the worst fantasy performances through Thursday and Sunday's games so far in Week 13's Fantasy Football Wrap Up. Alex Smith threw for 366 yards, 4 touchdowns, 0 interceptions, and had 1 long rush for 70 yards. Smith bounced back from a few off-games and finished as the highest scoring QB of the week with 37.6 fantasy points. Josh McCown had himself a huge day against the Chiefs, throwing for 331 yards, 1 touchdown, and did not throw an interception. McCown ran for 19 yards and 2 touchdowns on 7 rushes and finished as the second highest-scoring QB this week with 31.1 fantasy points. In a convincing win against the Bills, Tom Brady had a disappointing stat-line, throwing for 258 yards, 0 touchdowns, and 1 interception Brady had his worst fantasy performance of the year, scoring only 8.3 fantasy points. Brady wasn't the only quarterback to have his worst fantasy game of the year- Matt Ryan couldn't do much against a stout Vikings defense, throwing for only 173 yards, 0 touchdowns, and 0 interceptions while gaining a single yard on one carry, totaling 7.0 fantasy points. Alvin Kamara cannot be stopped. Once again he finds himself as the highest-scoring running back of the week with 29.6 fantasy points. Like last week, Kamara got it both on the ground and through the air - Kamara had 60 yards and 2 touchdowns on 9 carries and caught 5 passes for 66 yards. Patriots' off-season acquisition Rex Burkhead scored 25.3 fantasy points and finished as the second-ranked running back of the week. Burkhead ran for 78 yards and 2 touchdowns on 12 carries and caught 3 passes for 25 yards. Jordan Howard has disappointed as of late and could not take advantage against a 49ers team that was previously allowing the most fantasy points on average to opposing running backs. Howard only ran for 28 yards on 13 carries, and lost 5 yards on 1 catch out of the backfield, finishing with 4.3 fantasy points. While Frank Gore looks to be a hall of famer one day, he certainly wasn't for owners on Sunday. Gore ran for 61 yards on 13 carries and failed to record a target out of the backfield or find pay dirt, finishing with 6.1 fantasy points. 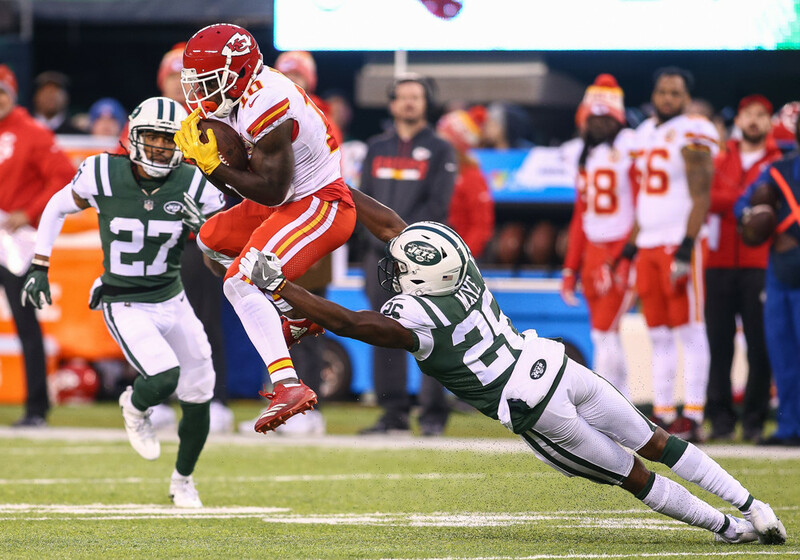 Tyreek Hill continues to dominate this season and this week was no different. Hill gained 185 yards and scored 2 touchdowns on 6 receptions, totaling 36.5 fantasy points, finishing as the highest-scoring wide receiver in Week 13. Nelson Agholor continues to produce week after week, hauling in 7 receptions for 141 yards and a touchdown, finishing with 27.1 fantasy points. Brandin Cooks was not a huge part of the Patriots' game plan Sunday against the Bills, catching 2 of 3 targets he saw for 17 yards. Cooks had one carry for 5 yards and finished with 4.2 fantasy points. A week after scoring 50.8 fantasy points, Julio Jones could not produce on Sunday in a loss to the Vikings. Jones caught 2 of 6 targets for 24 yards, finishing with only 4.4 fantasy points. The highest-scoring tight end from this past week wasTravis Kelce who had 4 receptions for 94 yards and 2 touchdowns, finishing with 25.4 fantasy points. For the second week in a row, Rob Gronkowski finished with the 2nd-most fantasy points for tight ends, this time with 23.7. Gronkowski had 147 yards on 9 receptions, and while he may have helped some owner's reach the fantasy playoffs, he may miss that first playoff game if the league decides to suspend him for his late hit on Sunday. Even with Michael Crabtree and Amari Cooper not playing due to their respective suspension and injury, Jared Cook was barely utilized in the offense on Sunday. Cook caught 1 of 5 targets for 9 yards and totaled 1.9 fantasy points. Zach Ertz left Sunday night's matchup against the Seahawks near the end of the 3rd quarter, but up until that point, he was not producing. Ertz finished the day with 24 yards on 2 receptions, scoring 4.4 fantasy points. The highest-scoring defense of the week was the Miami Dolphins Defense who dominated Broncos' quarterback Trevor Siemian all day long. The Dolphins recorded 3 interceptions (1 returned for a pick-six), 2 safeties, 1 blocked kick and 3 sacks, scoring a total of 27.0 fantasy points. The second-highest scoring defense this week was the Dallas Cowboys Defense who had 2 interceptions, 2 fumble recoveries, 4 sacks and 1 punt return for a touchdown. The Cowboys defense bounced back with a solid performance and scored 21.0 fantasy points on Thursday night. The highest scoring kicker of the week was Greg Zuerlein who kicked field goals from 20, 24, 41, and 56 yards out and converted 2 out of 3 extra points. Zuerlein finished the week with 17.0 fantasy points. Baltimore Ravens' Justin Tucker who kicked field goals from 38, 46, 51, yards out and converted 5 extra points. Tucker finished Week 13 tied as the highest-scoring kicker with 17.0 fantasy points.